BENSON, N.C. (Sept. 7, 2017): Last year’s PDRA Drag Wars was, simply, electrifying. This weekend’s event, held for the second consecutive year at GALOT Motorsports Park, is full of promise for the same incredible entertainment. 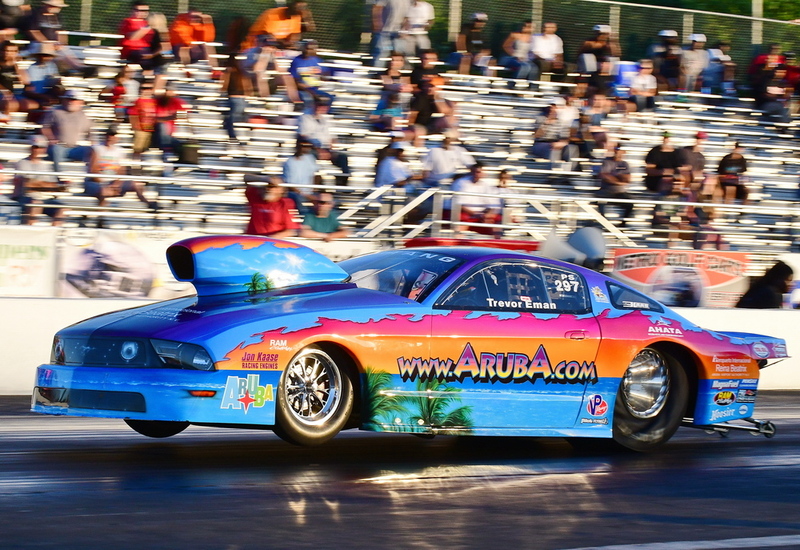 Team Aruba is already on the grounds, taking advantage of the all-day test session PDRA offers on Thursday of every event. Team Aruba and PDRA visited GALOT Motorsports Park in April of this year, as well, with Trevor Eman and the gang from Aruba taking the top qualifying spot in Extreme Pro Stock and pushing the Aruba.com Mustang all the way to the semi finals. Eman hopes the team can continue that success this weekend. “I like the fact that we are getting the chance to race at GALOT in Benson, NC for a second time this year,” explained Eman. “The nice thing about this is when you race at a track twice in a short span, you have your notes and runs from only a couple of months before that you can build off of. You’re not starting from scratch. “Most of the teams here this weekend were also at the spring event, so everyone will have something to go off of, which means the fans will have the opportunity to see some very good and fast racing this weekend. “We certainly hope to be one of those teams to continue off our good runs we made at the first race here this year, where we qualified number one. The weather seems to be similar to what it was earlier in the year and we know the track prep is going to be similar, as Jason Miller and his crew have been doing a good, consistent job all season long. So hopefully our success from the race earlier this year will give us an advantage this weekend. Although a three second Pro Stock run has been elusive thus far, breaking that barrier this weekend is not out of the question. The North Carolina heat will be settling into fall with temperatures dipping into the 50s this weekend. Hurricane Irma is not expected to impact North Carolina until Monday, so a clear and mild weekend will leave the door wide open for Eman and team. As the current record holder at 4.022, which Eman set in June of this year, Team Aruba has what it takes to get the job done.